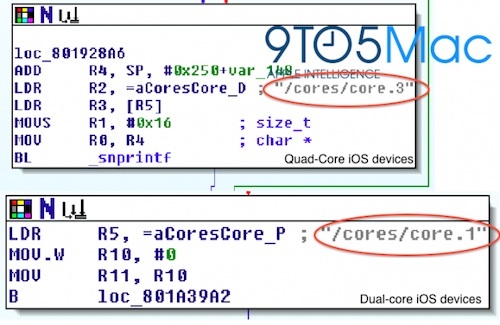 9to5Mac found evidence of support for quad-core processors that was hidden deep inside the latest iOS 5.1 beta. Apple leaving references to quad-core chips in the iOS 5.1 beta is notable because iOS 5.1 is the software currently being tested against the third-generation iPad. Speed increases are an expected part of Apple’s iOS device hardware upgrades. Apple's A6 system-on-a-chip has been rumored several times to carry a quad-core processor that could be included in the company's next-generation iPad and iPhone models which are rumored for a release around March of this year.